The year 2017 continues the successful concept “Rising Stars – a taste of future” as the annual internationally-renowned gastronomic festival will, once again, bring together the finest chefs from Greece and around the globe. 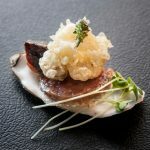 Sani Gourmet 2017 is dedicated to young chefs whose hard work has recently paid off with prestigious awards and accolades including a first Michelin star, as well as up-and-coming chefs whose talent is expected to shine in the culinary world. During Sani Gourmet 2017, the cosmopolitan restaurants of Sani Resort will host 9 talented chefs from Greece and around the world. 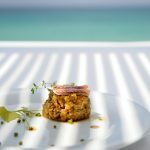 Visitors to Sani Gourmet will have the opportunity to enjoy the guest chefs’ exceptional menus; an experience we hope will be talked about for years to come. All the dinners are adults only. Ticket holder accepts that he might share a table with other participants. In case that the ticket holder shows up late after the commencement of the dinner, his serving will start from that point and on as with the rest of the participants. Sani Gourmet reserves the right to change the chefs without further notice. For more information please contact the Sani Resort Front Office Desks or call +30 23740 99553.